Fire Emblem Heroes: Feh’s Summer Quiz – What is it? Since the launch of Fire Emblem Heroes, Nintendo and Intelligent Systems have run several “Quiz Campaigns” for the game. Fans have to answer questions on Twitter, and if the majority of voters get all the answers right, they get some bonuses in-game (such as Orbs and Hero Feathers). 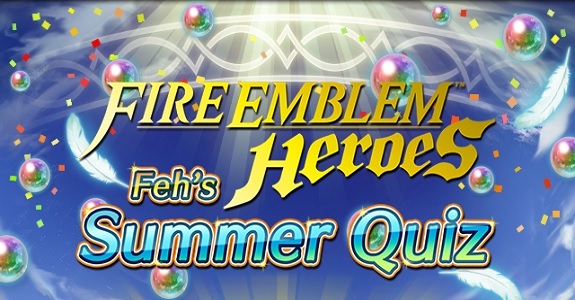 And today, the latest one went live: it’s called Feh’s Summer Quiz, and it runs until August 22nd at 12.59PM JST / 5.59AM CEST / 4.59AM BST – August 21st at 8.59PM PT / 11.59AM ET. Click here to check it out! There’s quite a few differences with the previous Quiz Campaigns. For starters, this one is officially available in English (and the other languages Fire Emblem Heroes is available in)! With the previous ones, players from all around the world could participate, but the whole thing was only available in Japanese… Also, the voting now takes place on the official website, and you need a Nintendo Account. This time, there’s 7 questions to answer. 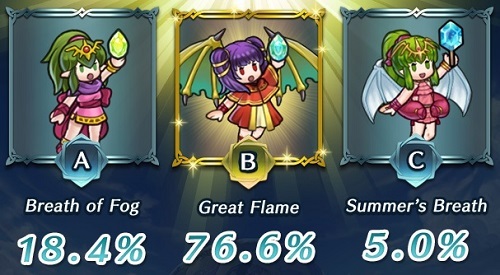 If the majority of players answer at least 5 of them correctly, then everyone (even those who did not participate) will receive 10 Orbs and 5 000 Hero Feathers. But that’s not all! You can also get 1 Orb each time you vote (via the event website), which means you can get a total of 17 Orbs! Naturally, you have to use the same Nintendo Account as the one linked to Fire Emblem Heroes (in case you have several of them). You also get 100 Platinum Coins for My Nintendo as reward for participating. The in-game rewards will be sent as Log-in Bonus in late August. You have exactly 24h to answer each question (until 12.59PM JST / 5.59AM CEST / 4.59AM BST / 8.59PM PT / 11.59AM ET), and the answer is revealed the following day. The number of questions answered correctly will be officially revealed once the event is over. Results so far: Questions 7 / 7 answered correctly, which means the reward (10 Orbs and 5 000 Hero Feathers) has been unlocked! It will be distributed on August 23rd! Question 1: In the opening movie for Book II, Fjorm summons ice pillars to attack Surtr. How many of them collide with Surtr’s ball of flame? Question 2: In the Fire Emblem Heroes game, three versions of Hector have been released so far. Each one has differences. Out of the three, which appears taller than the others in the stance he takes at the beginning of a turn? Question 3: Which of these dragonstones allows the use of Great Flame? Question 4: When Marth and Caeda increase their Support Rank to B, what weapons do they hold in the scene shown? Question 5: Which of these maps features the theme song from the 1990 Japan-only release Fire Emblem: Shadow Dragon and the Blade of Light? Question 6: Arvis, Leo, and Sharena all pose with their hands raised when using magic. Out of the three, who raises their hands fastest at the beginning of a turn? Question 7: Anna, Alfonse, and Sharena can refine their weapons as of version 2.8.0. If a team consisting of Anna, Alfonse, and Sharena without refined weapons battles a team of Anna, Alfonse, and Sharena with refined weapons, what will be the outcome? As usual, keep an eye on the Events and Content Updates and Characters page to keep up to date with all that’s happening in Fire Emblem Heroes!